Ford Motor Co. unveiled the 2018 Expedition in Dallas Tuesday, the first full redesign of the large sport-utility vehicle since its introduction in 1996. The second-generation Expedition is packed with innovative technology and follows the pattern set by Ford with the gradual switchover of its F-series trucks to aluminum bodies starting with the 2015 model year. The new SUV is 300 pounds lighter than the current model thanks to its high-strength aluminum-alloy body and a redesigned high-strength steel frame. “The F-150 proves the move to aluminum works for consumers and it lets Ford add features like the panoramic sunroof and keep the weight savings,” said Stephanie Brinley, an analyst with IHS Markit. The Expedition also gets a new 3.5-liter turbocharged V-6 engine mated to a 10-speed automatic transmission and new driver assist features designed to make driving and towing easier. It was last refreshed in 2015 with the current V-6 engine. Ford’s decision not to pursue a a full redesign in over two decades can be tied to the unknown regarding fuel economy regulations. “Also, now, technology is in demand and there has to be a level of technological sophistication if these vehicles are going to stay on the showroom floor,” Lindland said. The new vehicle hits the market at a time when light trucks, which includes pickup trucks, crossovers, and large SUVs like the Expedition, accounted for 66 percent of U.S. autos sale last month, according to Autodata Corp., an industry research firm. The Expedition sold 59,835 units in 2016, which marks a 44 percent increase over last year. This put Expedition sales in the U.S. at third place among large SUVs behind the Chevrolet Suburban and Tahoe. “Once we’re into a full year of sales in 2018, the Expedition will have an impact, but Chevrolet really does own this segment with its twins,” Brinley said. 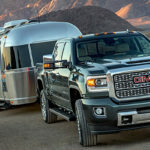 “With 410,000 units sold last year, 163,000 were Chevy while 90,000 were GMC. They’ll lose some sales to the Expedition, but more at risk are the Armada and Sequoia,” she said. Part of the Expedition’s sales growth can be credited to low gas prices and moderate interest rates that make it easier for consumers to purchase large vehicles. Automakers are answering the call with a wide selection of crossovers, SUVs and pickup trucks. It has become the most profitable segment of the industry. The average transaction prices of large SUVs such as the Expedition soared 22.9 percent to nearly $58,000 from 2012 to 2016, according to market research firm J.D. Power. Meanwhile, the average transaction price of passenger cars mainly remained flat. Midsized sedans such as family cars like the Toyota Camry and Honda Accord, a fiercely competitive segment in recent years, actually declined by 1.2 percent, to $21,951. Compact cars fell 5.2 percent, to $18,648. Ford designers focused on making the vehicle easier to drive, especially while towing trailers and boats. Towing ranks high on the list for the SUV’s customers. Half of those who park park an Expedition in their driveway say it’s important with 15 percent towing weekly or monthly, the automaker said. The Expedition’s lighter architecture will improve fuel economy compared with the current model but carries additional importance because of how weight savings translates directly into better capability. The Expedition also comes with new tech features including available Pro Trailer Backup Assist. First introduced on the 2016 Ford F-150, it requires a one-time setup to pair each trailer with the vehicle. Once setup is complete, the driver simply turns a knob and the Expedition handles steering the wheels and managing its speed. An all-new Terrain Management System helps improve handling with a choice of drive modes for varying road conditions. Choose from normal, sport, tow/haul, eco, grass/gravel/snow, sand and mud/rut to manage everything from slippery pavement to off-road adventuring. Wireless charging, a first for any Ford vehicle, is available on the Expedition. It also comes with Wi-Fi connectivity for up to 10 devices, Sync 3 with Apple CarPlay and Android Auto, Sync Connect with FordPass and a rear-seat entertainment system. Six USB chargers, four 12-volt outlets and a 110-volt outlet will keep everyone connected. And an optional 12-speaker B&O Play premium audio system will bring joy to audiophiles. There is seating for up to eight passengers with a choice of XLT, Limited and Platinum trims or an XL trim designed for fleet customers. Large families looking for more interior room can opt for the new extended-length Expedition Max, available in all trim levels. The 2018 Ford Expedition is built at its truck plant in Louisville, Ky., and is set to arrive in dealerships this fall.